The photos in the five-in-one frames are harvest scenes taken this summer, and have been my most popular so far. I plan to do a seasonal thing, with winter photos and with North Dakota flowers. Below the harvest scenes are my decorative dresses and dish soap bottle pinafores, and below the sunsets are greeting cards and notecards. Below those are the hair scrunchies and dishcloths, and below those, hand towels with crocheted edging and sport bottle and can cozies. 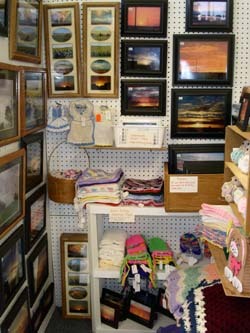 You can order everything but the framed photos from this site, so you can find better pictures elsewhere.